Adventures in a Crafting Life: Emily's Quilt Finished! I finished this quilt a couple of weeks ago but, being a Christmas present for a gorgeous little girl, had to wait until I'd given it until I could share it. 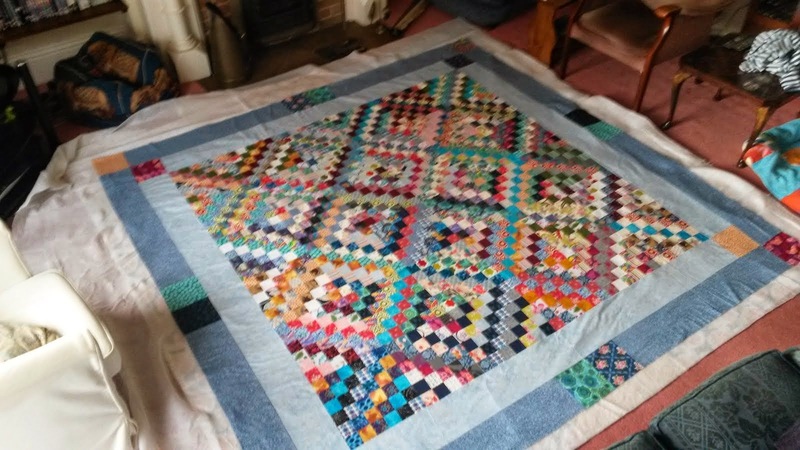 So here it is: Emily's Quilt! I wanted this to be a definitely girly quilt, but not too pink and fluffy. The recipient is only fifteen months old, so who knows what colours she will like! The ladies at my local fabric shop, Coles, were very helpful (and patient!) pulling bolts of fabric out to help me find the right background fabric to go with the selection of fat quarters I'd pulled from the racks. In the end I went for a dashwood studios cream polkadot fabric for the background, which brought the mixture of accent fabrics together well. My plan was to keep the design for this quilt fairly simple. I used six patterned fat quarters, and 1.5m of the cream polkadot background fabric, cutting them into 6.5 inch squares (to be 6 inches finished), and laying them out alternately in a 9x11 grid. I pieced the backing from some big flowery fabric from my stash (I love it! ), and quilted it with orange peel quilting in the same way I quilted my wall hanging. I finished it off by binding in a deep purple fabric. The finished quilt is around 54" x 66", a nice size for snuggling. Linking up to Crazymomquilts, and Confessions of a Fabric Addict. It turned out great. I like the name in the bottom - great idea!! Lovely finish! I like that you included her name in the quilt...What a nice gift! What a sweet little quilt! She's sure to love it! Whoop whoop! !